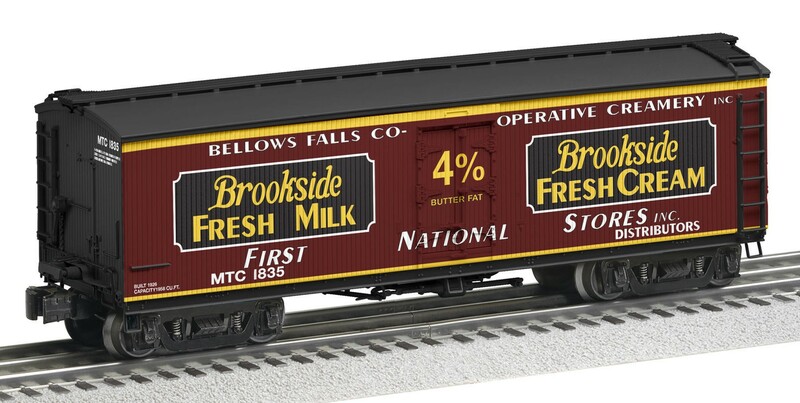 Rich and luxurious burgundy sides adorn these two Lionel Scale Milk Reefers. 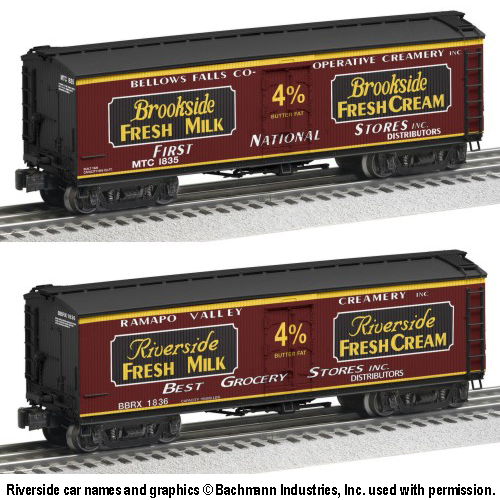 The 6-58285 Brookside and 6-58286 Riverside Milk Reefers are 100% Lionel made and decorated. Cars feature die-cast trucks and internal simulated glass lined milk storage tanks which can be seen when removing the roof. Please, do not delay; order today. Price: $96.99/Single - $171.99/Pair Preorder Now! Delivery end of 2019. 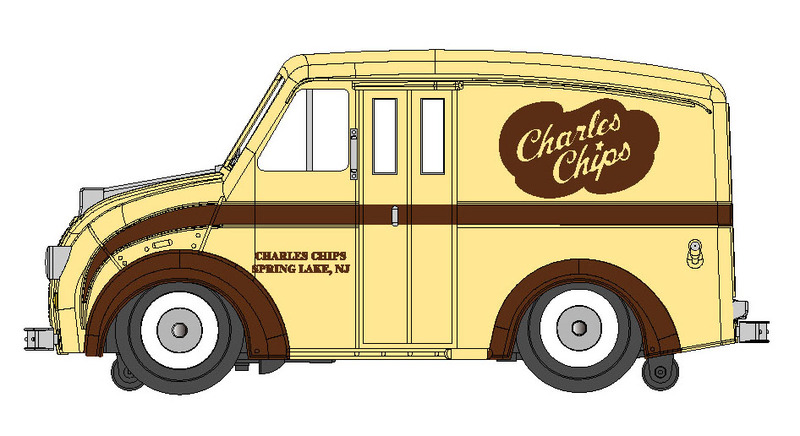 The Charles Chips company was started in 1942 when Effie Musser sold her potato chips through a distributor, who put them in distinctive tins, and named them Charles Chips after Charles Street in Baltimore. They now sell chips, pretzels, and cookies from their website and other outlets. The E-Z Street motorized Divco truck is made by Williams by Bachmann. 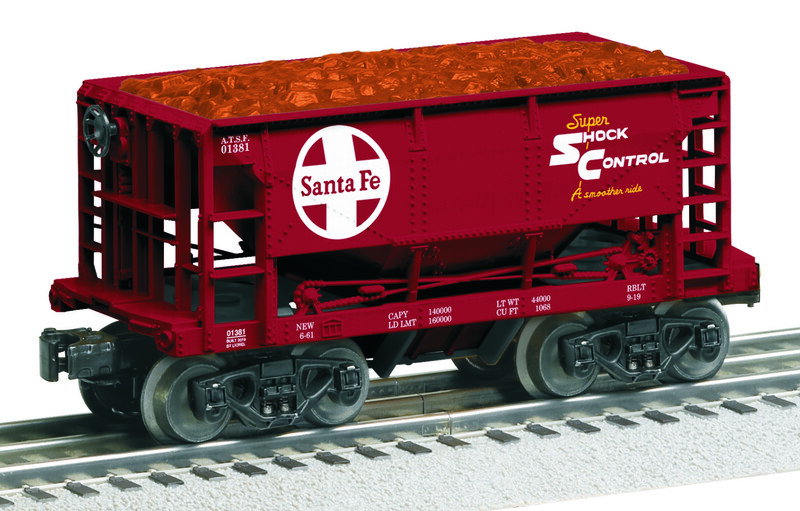 This Truck is a perfect companion to the METCA release of the 9700/6464 sized box car # 6-58038, made by Lionel. 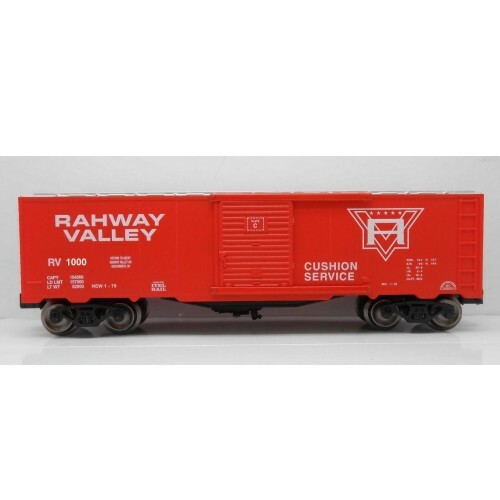 The Rahway Valley Railroad (RVRR) was a short-line railroad in the Northeastern United States which connected the Lehigh Valley Railroad in Roselle Park and the Central Railroad of New Jersey in Cranford and with the Delaware, Lackawanna & Western in Summit. 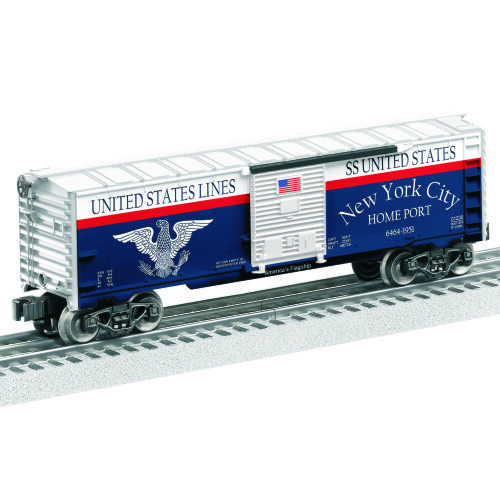 The RV 'Superman inspired' logo was adopted in the early 1980's when Bernie Cahill, President of the RV, leased a large group of new boxcars from ITEL Rail Corp. 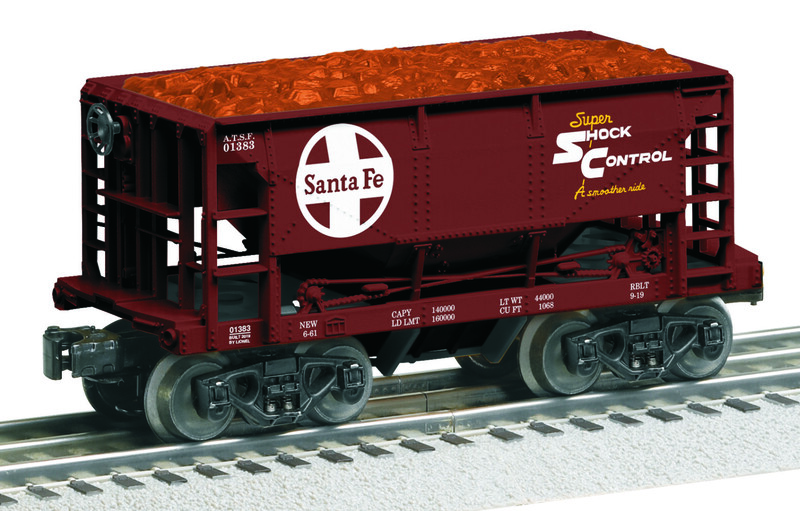 The car, made by RMT, features a stamped metal frame, metal brake wheel and die-cast trucks. PHOEBE SNOW was a runaway successful marketing campaign promoted by the Lackawanna Railroad. Phoebe, a woman dressed in white, was symbolic of how clean their locomotives ran because they used hard anthracite coal. After the merger with the Erie Railroad, the widely popular Erie Lackawanna continued to use this reference for their top-of-the-line named trains. METCA has incorporated this theme into our 2014 Division Car. 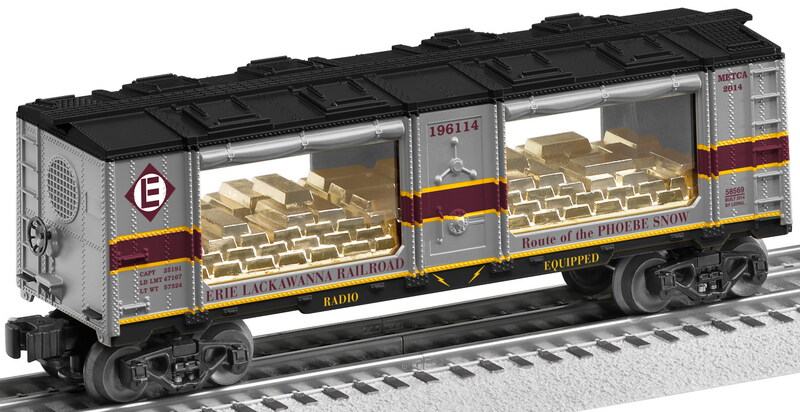 This new Limited Production 6-58569 Erie Lackawanna Mint Car is 100% Lionel made and decorated, features die-cast sprung trucks/couplers, a metal brake wheel, a metal frame, and includes a gold bullion bar load. Taking design clues from Lionel’s postwar 2341 Jersey Central FM Trainmaster, METCA has incorporated this paint scheme into our 2013 Division Car, the 6-58534 METCA Jersey Central Mint Car. This car includes a copper plated load, symbolizing the transporting of copper plates for the maintenance of one of our nation’s most recognized symbols … the Statue of Liberty. 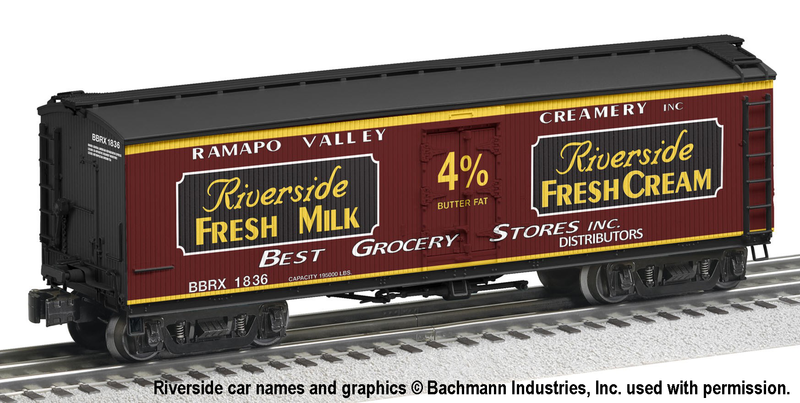 This car is the perfect companion to any Jersey Central FM Trainmaster. 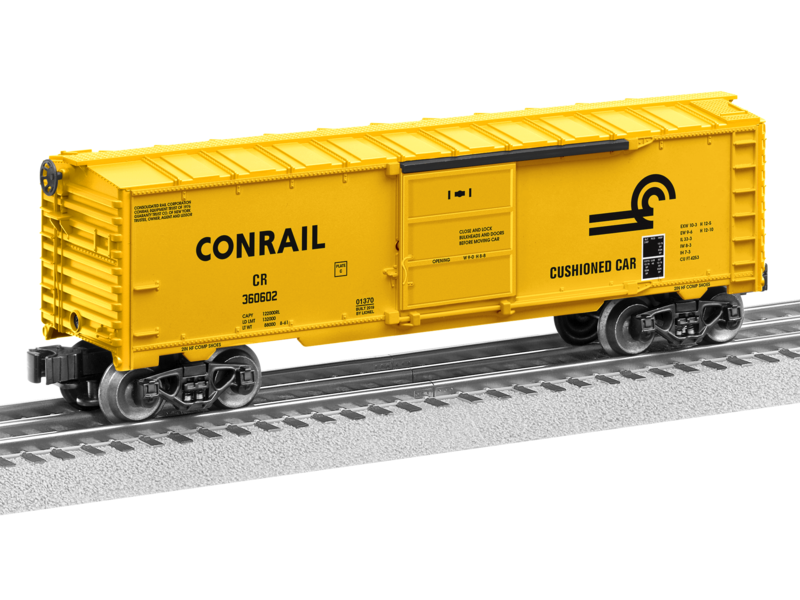 The cars are 100% Lionel made & decorated and feature die-cast sprung trucks/couplers, a metal brake wheel, and a metal frame. 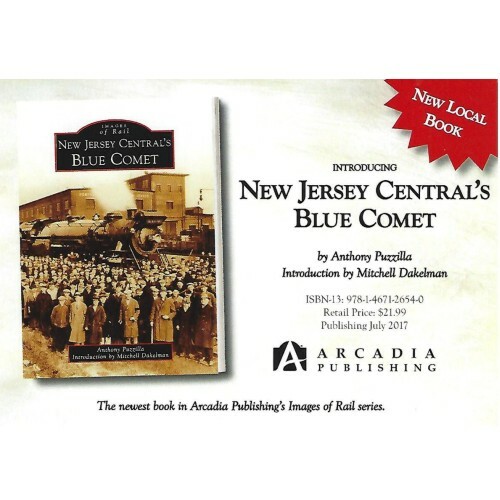 The Blue Comet was the Central Railroad of New Jersey’s premium method of travel between Jersey City’s Communipaw Avenue Railroad Terminal and Atlantic City. METC has incorporated this paint scheme, along with design references to the Statue of Liberty from the CNJ logo, into our 2013 Division Cars. 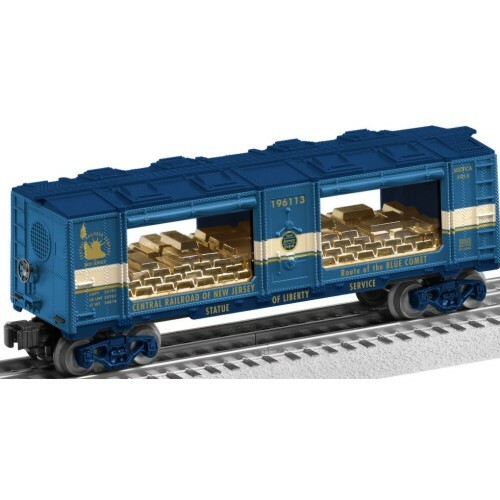 This Limited Production 6-58523 METCA Blue Comet Mint Car has blue painted trucks and includes a gold bullion bar load. 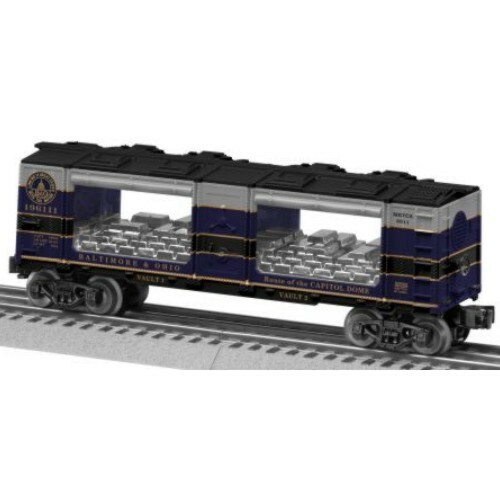 This cars is the perfect companions to METCA’s ongoing railroad themed Heritage Mint Car Series. The cars are 100% Lionel made & decorated and feature die-cast sprung trucks/couplers, a metal brake wheel, and a metal frame. Only 500 Made. The Capitol Dome has nearly always been a meaningful part of the Baltimore & Ohio Railroad logo. For a time, around the outside of the Capitol Dome image, there was a ring that contained the slogan “Linking 13 Great States With The Nation”. METCA has incorporated this logo and slogan into our 2011 Division Car. 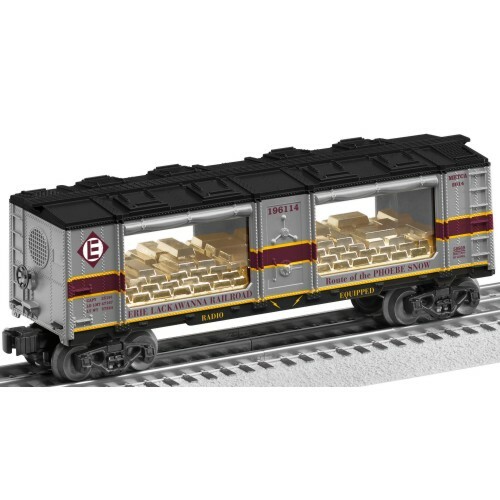 This new Limited Production 6-52583 METCA Baltimore & Ohio Mint Car is 100% Lionel made and decorated, features die-cast sprung trucks/couplers, a metal brake wheel, a metal frame, and includes a chrome bullion bar load. 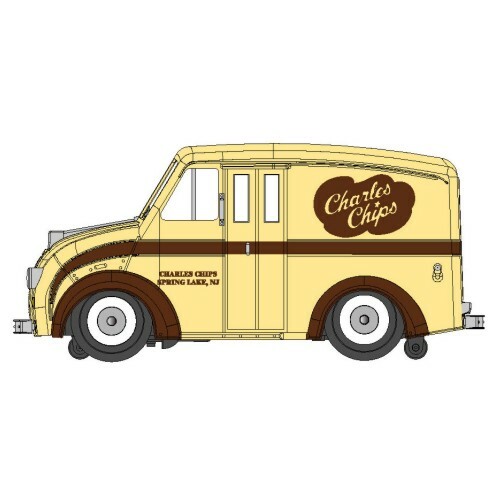 This car is the perfect companion to METCA’s ongoing railroad themed Heritage Mint Car Series©. 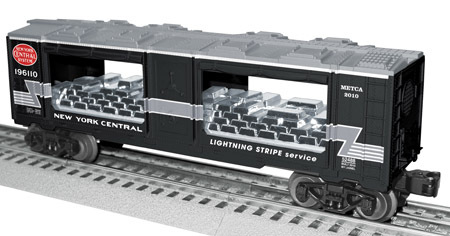 LIGHTNING STRIPE service could have been the New York Central's next fast freight service, following up on the success of their Pacemaker Freight Service. 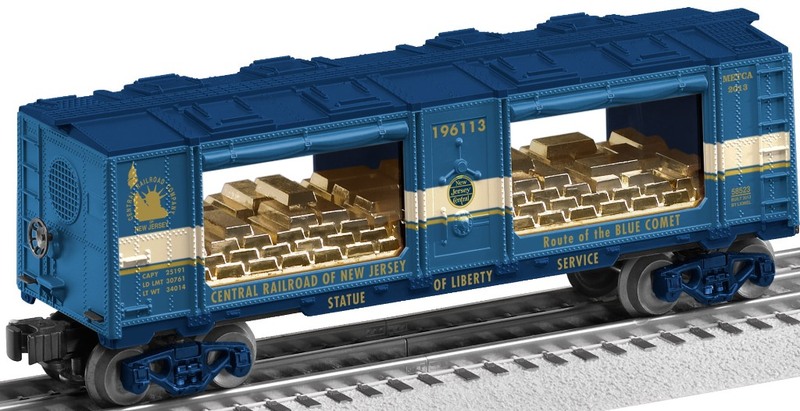 The METCA Division incorporated certain noteworthy elements from NYC's Lightning Stripe locomotive paint scheme into this Limited Production METCA Mint Car that includes a load of chrome-plated bullion bars. Raymond Loewy, the famous industrial designer, played a key role in shaping the Pennsylvania Railroad GG-1. 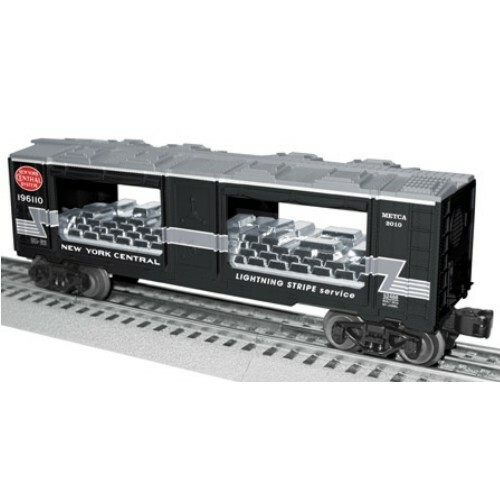 Although he never designed a Lionel Mint Car, the METCA Division incorporated certain noteworthy elements from Loewy's landmark design into these, Limited Production METCA Division Mint Cars from Lionel. These cars featured a gold-tone load of bullion bars. Price: Either for $89.99 In Stock! 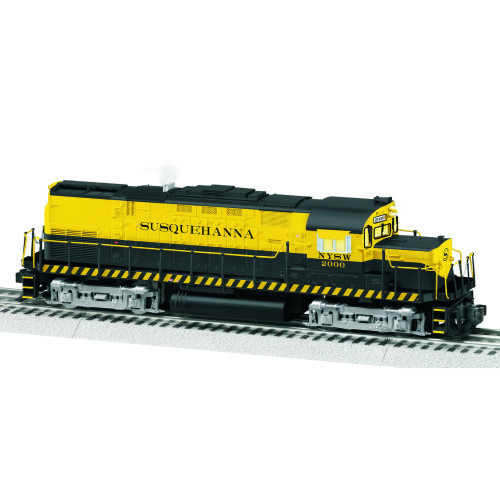 Our 100% Lionel made and decorated SD40-2 features all of the standard Lionel Legacy features that are included in Lionel’s regular Legacy locos, including Bluetooth. 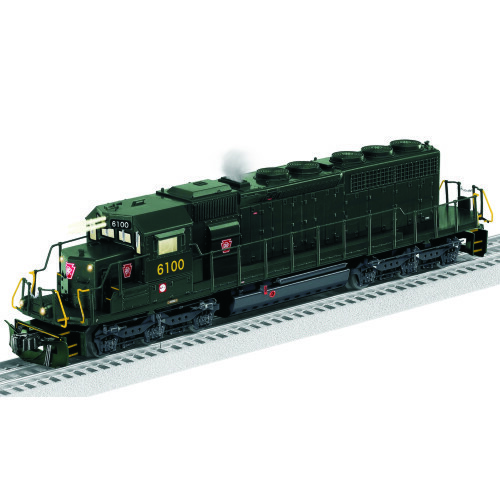 The SD40-2 ranks at the top of the charts in sales, and is still considered by many railroaders to be one of the best locomotives on the rails. Their reliability has kept thousands of these locomotives on the rails and they are still a common sight today over 45 years since their introduction. Most have passed through multiple owners and today can be found on class 1 railroads, lease fleets, regionals and short lines in every corner of the continent. METCA is excited to offer this unique Lionel 6464 sized box car. 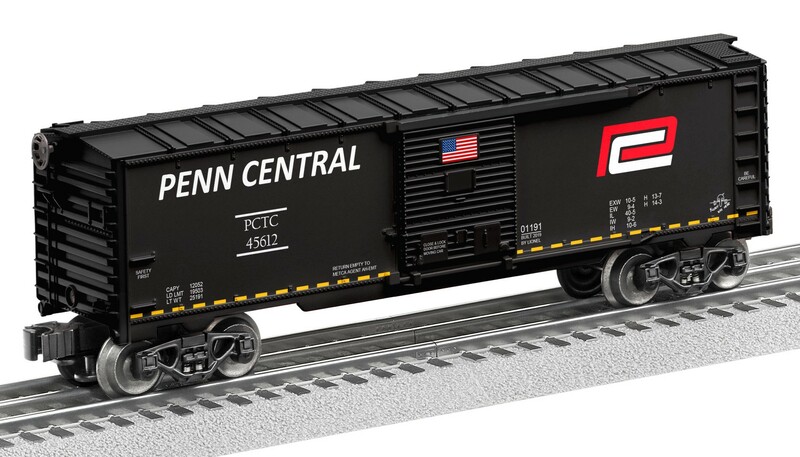 The Penn Central Box Car (1901191) is decorated in a Heritage inspired “what if” paint scheme. This car is Made in USA by Lionel. Car features die-cast trucks, metal frames and brake wheels. 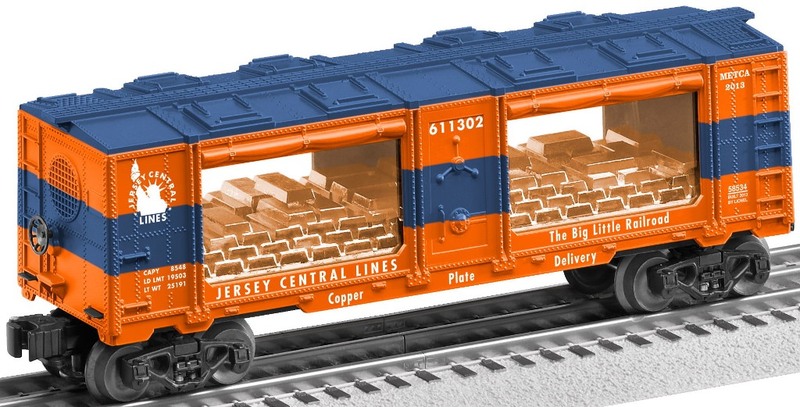 Order this car by itself, or save on shipping and order together with the METCA Long Island Box Car. Available exclusively from METCA Division. Only orders received by February 28, 2019 can be guaranteed. Price: $84.99 Preorder Now! Delivery in 2019. METCA is excited to offer this unique Lionel 6464 sized box car. 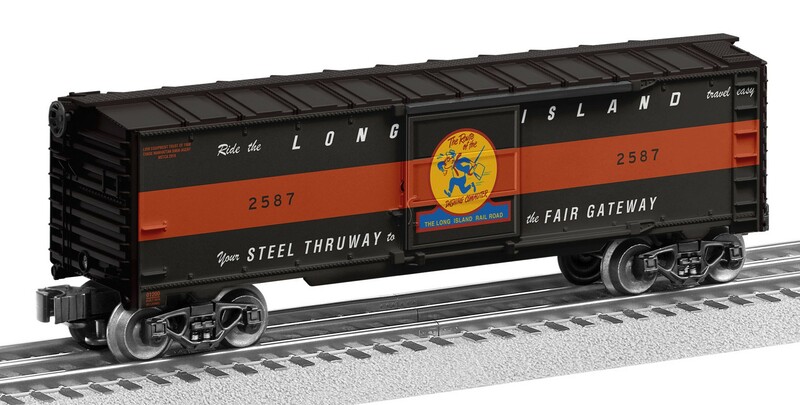 The Long Island Box Car (1901200) exhibits the famous Steel Thruway scheme. 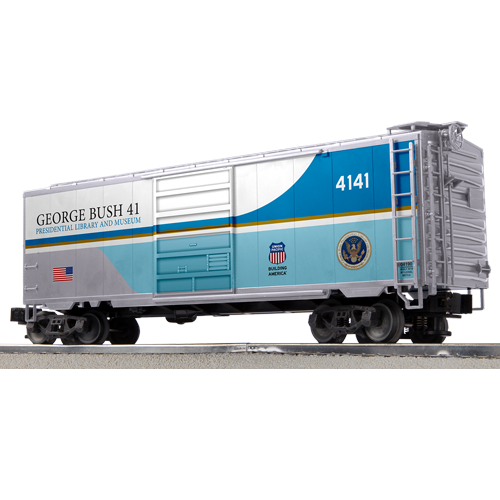 This car is Made in USA by Lionel. Car features die-cast trucks, metal frames and brake wheels. 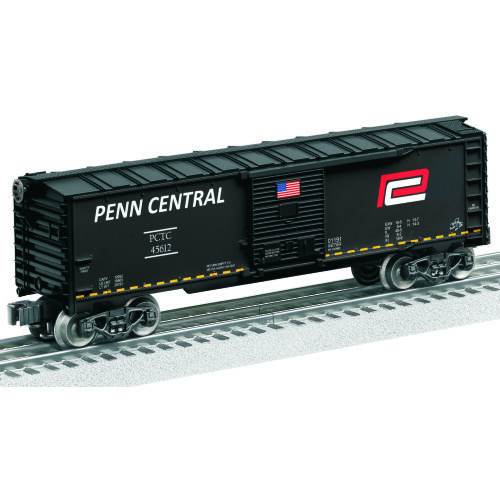 Order this car by itself, or save on shipping and order together with the METCA Penn Central Box Car. Available exclusively from METCA Division. Only orders received by February 28, 2019 can be guaranteed. 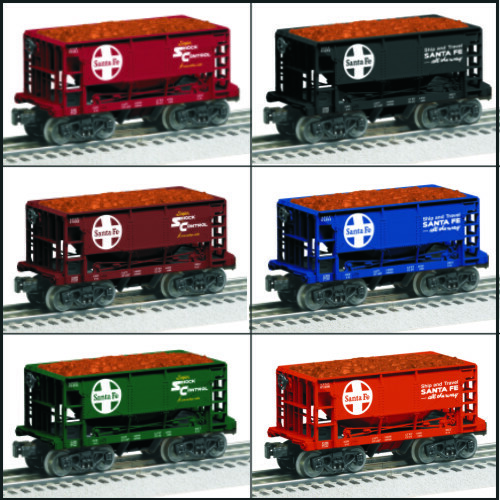 METCA is excited to offer this value priced 6-pack of Lionel ore cars. Each car features a unique road number and different graphics on each side of the car; the Ship and Travel slogan on one side and the Shock Control slogan on the other. Cars feature die-cast (non-sprung) trucks, ore loads, and metal brake wheels. The 6-pack of cars is packaged into one set box. Individual cars do not have individual boxes. Only 200 are scheduled for production. Order now. Available exclusively from METCA Division. Orders for 3-packs will be filled as inventory allows. Price: $159.99/6-Pack - $99.99/3-Pack Preorder Now! Delivery late 2019. Please help save America’s Flagship. The SS United States, over 100 feet longer than the Titanic, broke the trans-Atlantic speed record on her maiden voyage; a record she still holds to this day! Currently there is an effort ongoing to preserve this American Treasure. The SS United States is an irreplaceable piece of patriotic American History. 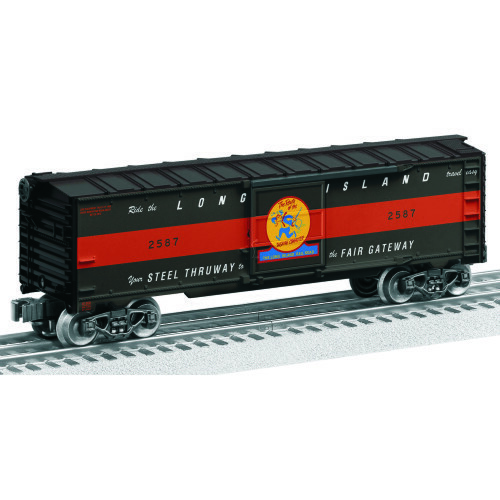 This 100% Lionel made and decorated 6464 sized box car is molded, decorated, and assembled in the USA. The car (1901230) features a stamped metal frame, metal brake wheel and die-cast sprung trucks. For more information on the SS United States and the Conservancy, visit www.SSUSC.org. Only orders received by May 31, 2019 can be guaranteed. Production begins shortly thereafter. A portion of the proceeds will be donated to the SS United States Conservancy. Price: $89.99 Preorder Now! Delivery in 2019. 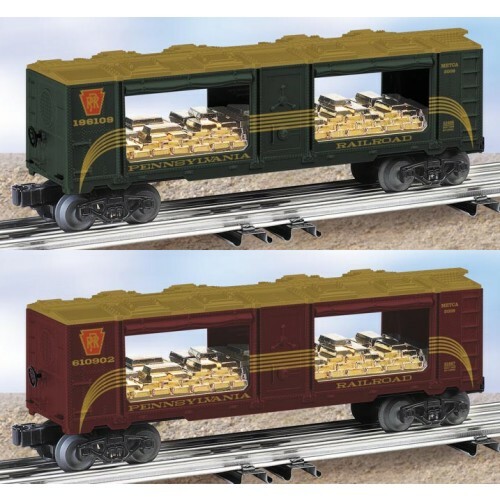 METCA is excited to offer these two unique Lionel 6464 sized box cars. 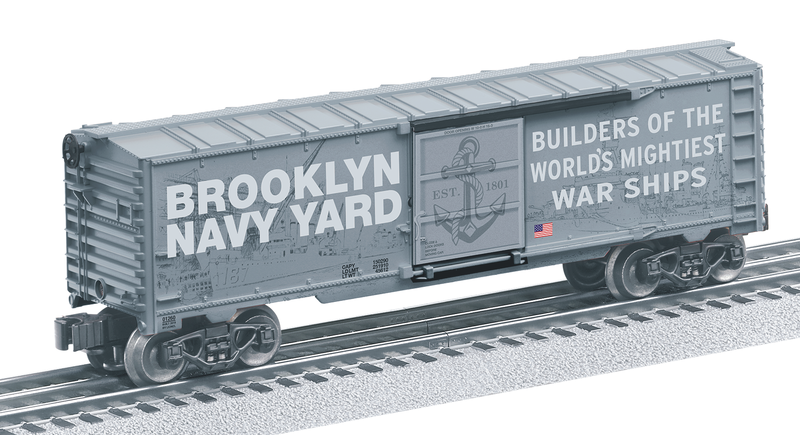 The Brooklyn Navy Yard Box Car (1901260) is decorated to honor the men and women that built our Navy’s ships (background images are navy ships at the dock; doesn’t reproduce well in picture shown; actual car will look nice). 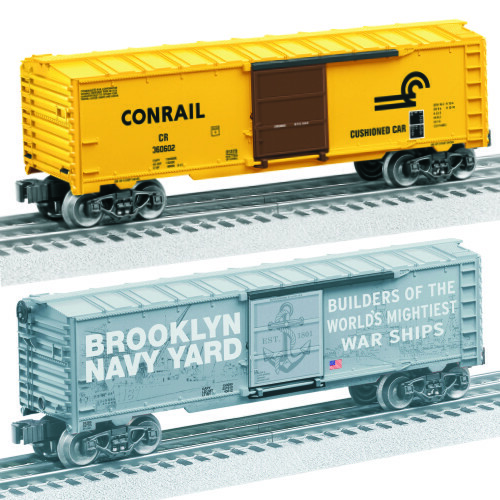 The Conrail Box Car (1901370) exhibits the unique FGE scheme and matches the real life car with a brown door on one side and a yellow door on the other side. Both cars are Made in USA by Lionel. Cars feature die-cast trucks, metal frames and brake wheels. Order either car separately or save on shipping and order both cars. Only orders received by May 31, 2019 can be guaranteed. Production begins shortly thereafter. Price: $84.99/Single - $159.99/Pair Preorder Now! Delivery end of 2019. 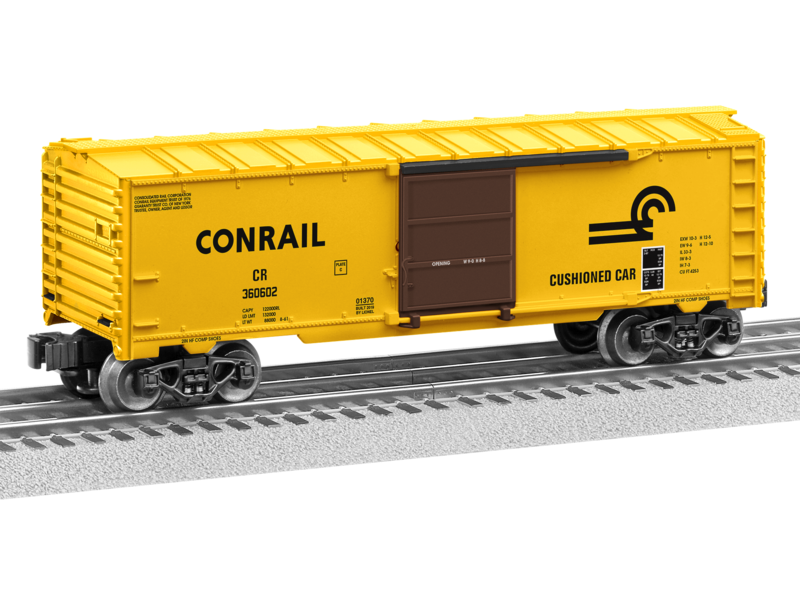 Our 100% Lionel made and decorated C-420 features all of the standard Lionel Legacy features that are included in Lionel’s regular Legacy locos, including Bluetooth. The ALCO Century 420 is a four-axle, 2,000 horsepower (1,491 kW) diesel-electric locomotive of the road switcher type. Cataloged as a part of ALCO's "Century" line of locomotives, the C420 was intended to replace the earlier RS-32 model. 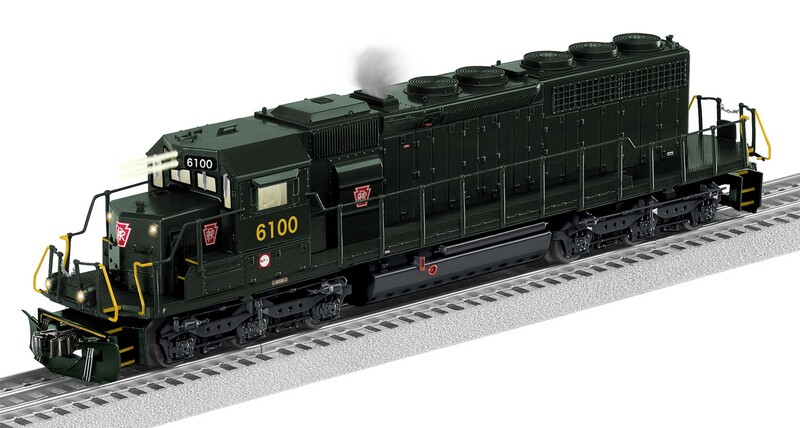 You can choose to pay in full now, or to reserve your loco with a $100.99 deposit, with the balance due when the engines are ready to ship. Price: $469.99 Preorder Now! Delivery in 2019. 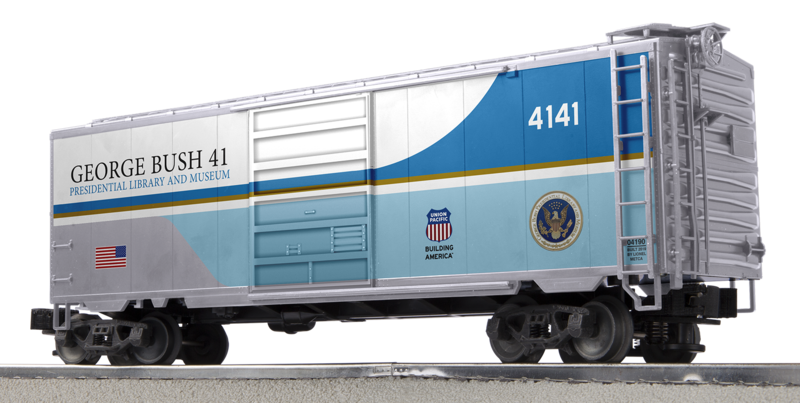 Made to be a companion piece to Lionel’s previously released Bush 4141 locomotive and caboose, this LionScale PS-1 Box Car is decorated in the Air Force One inspired striking color scheme applied to Union Pacific’s 4141 locomotive; painted to honor George H.W. Bush, the 41st President of the United States of America. 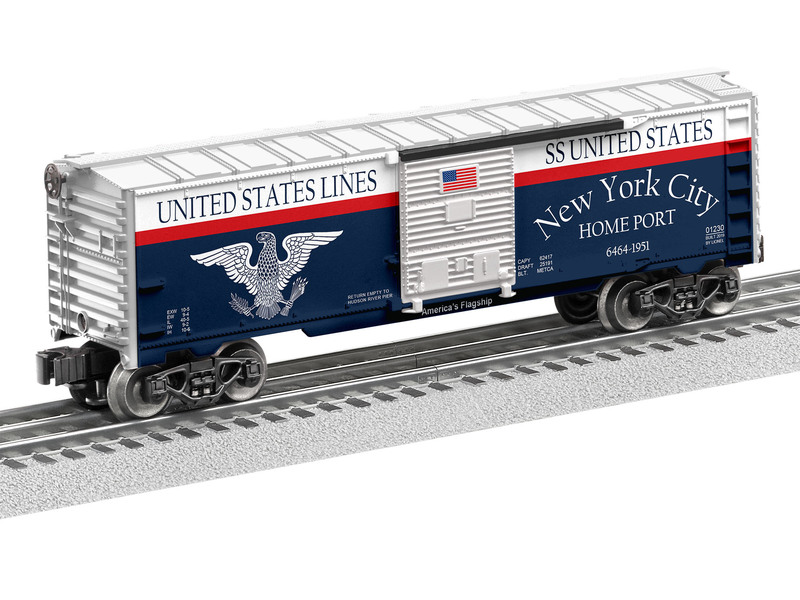 This 100% Lionel made and decorated box car is molded, decorated, and assembled in the USA. 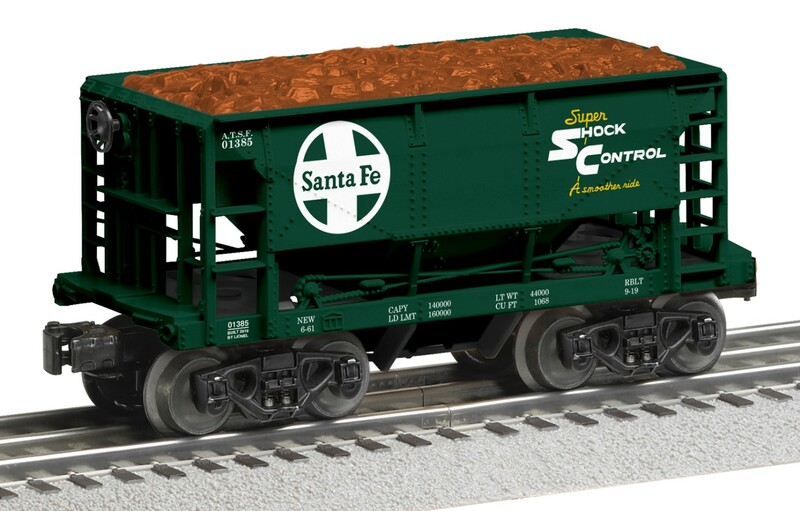 The car (1904190) features a stamped metal frame, metal brake wheel and die-cast trucks. Only orders received by May 31, 2019 can be guaranteed. Production begins shortly thereafter. 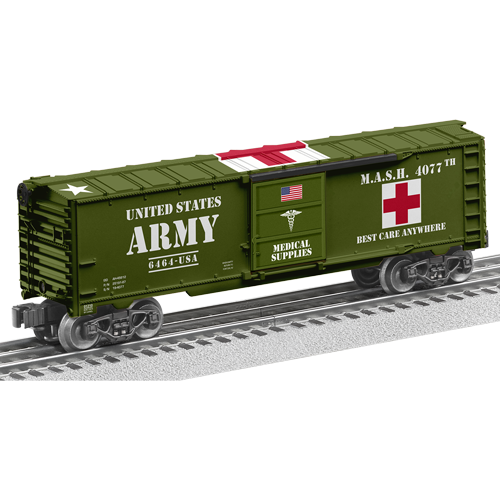 Mobile Army Surgical Hospital (M.A.S.H.) units were Army units which provide lifesaving surgical procedures to military personnel wounded in battle. The important work these doctor solders do was brought to the widespread awareness of the civilian world shortly after the Korean war. As opposed to rear hospitals which were commonly used in WWII, M.A.S.H. 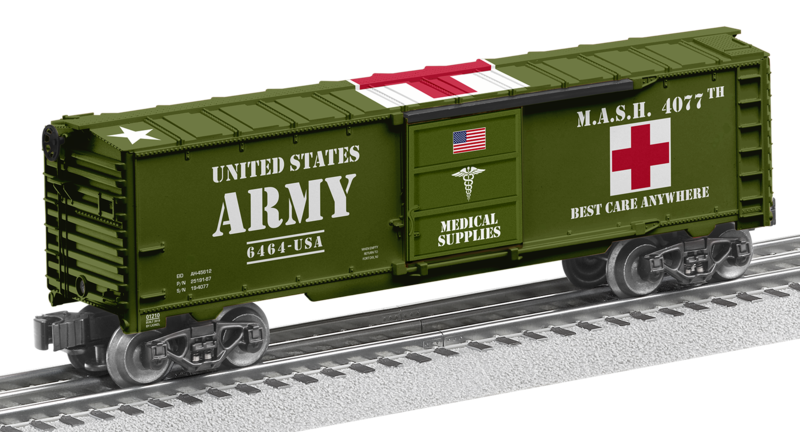 units were typically located near the front lines to reduce evacuation transport time, thereby greatly reducing mortality rates. The last M.A.S.H. unit was deactivated in 2006 and replaced with the Combat Support Hospital program. 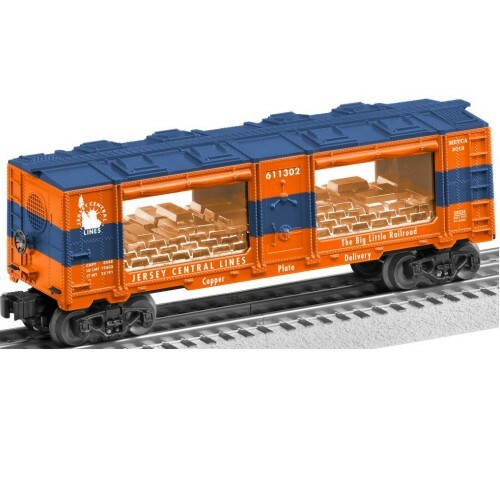 This 100% Lionel made and decorated 6464 sized box car is molded, decorated, and assembled in the USA. 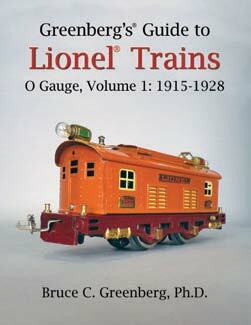 The car (1901210) features a stamped metal frame, metal brake wheel and die-cast sprung trucks. Only orders received by June 30, 2019 can be guaranteed. Production begins shortly thereafter. Convenience fee of 99 cents per item included for online orders. 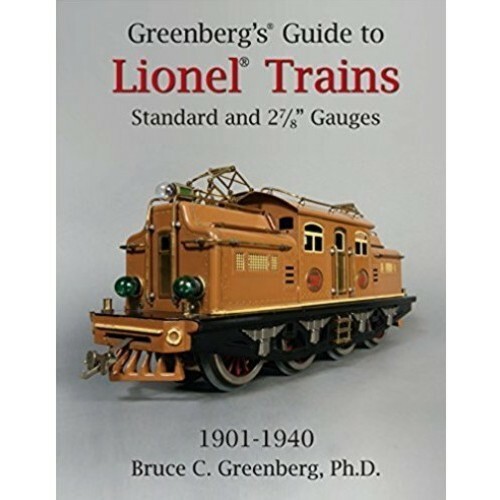 METCA is an authorized distributer of Bruce Greenberg's latest book which has received a very favorable review from the Editor of OGR Magazine, Allan Miller. Want a preview? Here are a few sample pages! Price: $107.00 Includes Shipping (to continental US) In Stock! 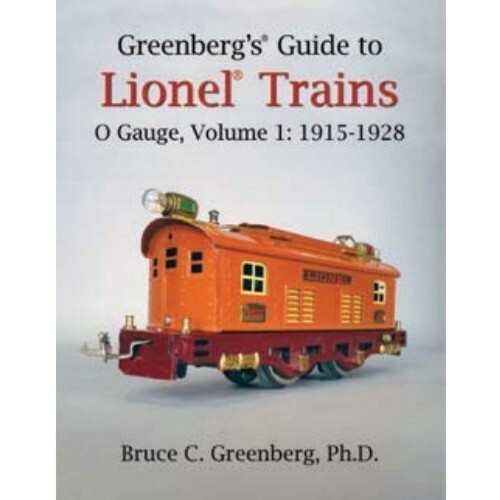 METCA is an authorized distributer of Bruce Greenberg's Standard and 2-7/8 guide, which has received a very favorable review from the Editor of OGR Magazine, Allan Miller. We also received a favorable comments from METCA MIGS, Ken Morgan. 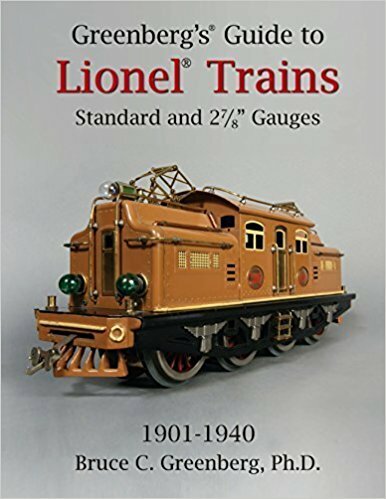 Ken is an avid Standard Gauge collector and is well recognized for his column "The Tinplate Cannonball" in The Lion Roars. Ken does substantial research for his columns and he has found Bruce's book to be an excellent resource. 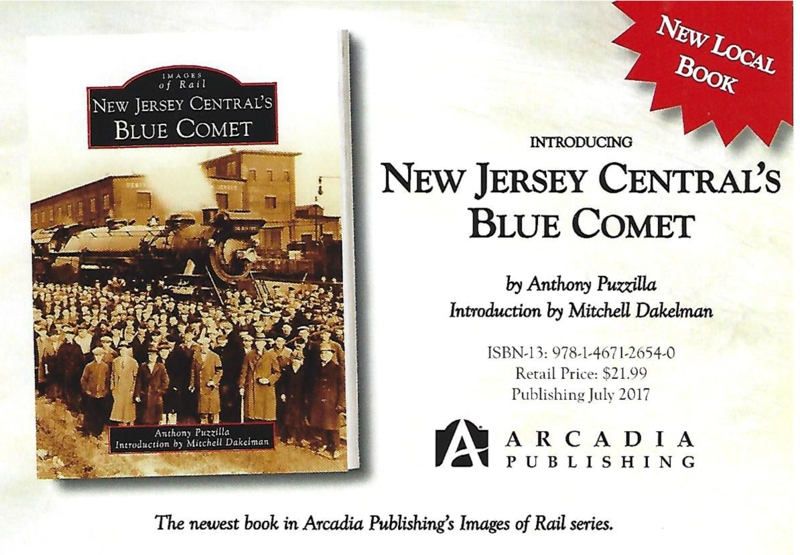 The New Jersey Central’s Blue Comet passenger train service operated from 1929 to 1941, on a route from the New York metropolitan area to Atlantic City. 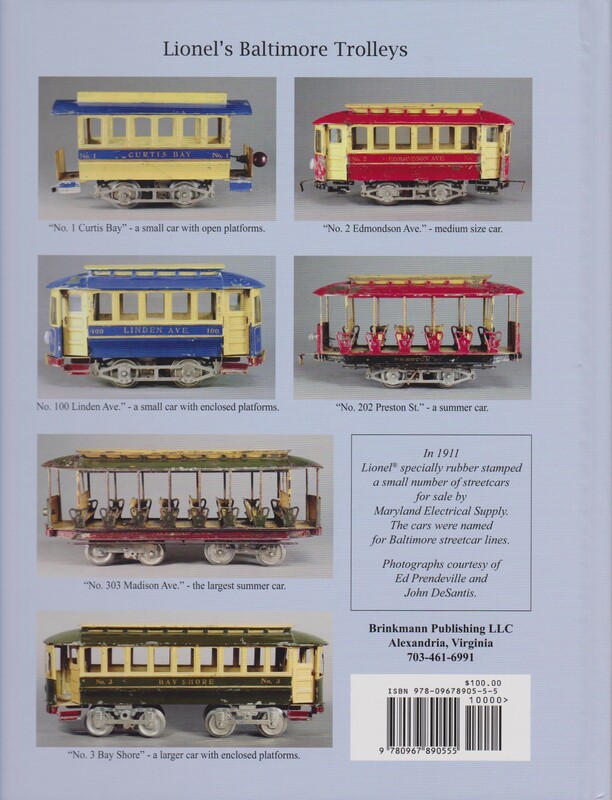 This book contains memorable images, many from private archival photograph collections, showing the remarkable history of this classic train and of the hardworking and dedicated people who made it all possible. Price: $21.99 + $5 Shipping (to continental US) In Stock! When you click on any link in the frame below, be sure to scroll to the top of this window to see all of the new page! When you've selected an item, be sure to enter the quantity you want to order in one of the boxes in the size & color grid before clicking on "Add to Cart." If you have any difficulty ordering items in the window below, just click here to visit the Apparel Store in a new browser window.